Every time Southwest Monsoon makes an onset over Mumbai, weather conditions become pleasant. It’s like the weather transforms from a not so pleasant concrete city to a breezy sea side star studded capital. The best part is weather conditions remain the same throughout the Monsoon season. Throughout Monsoon the maximums over Mumbai settle close to 30 degrees. However, due to close proximity to the sea, minimum temperatures do not drop subsequently and hovers around the mid-20s. The diurnal variation over Mumbai is also very low. The maximum city remains windy and humid keeping hot weather conditions at bay. Cool winds from the sea during the morning and evening hours keep temperatures in the comfortable range. The city experiences hot weather during the afternoon hours only due to absence of rain. Otherwise, Mumbai is the best place to be during this season. However, Monsoon is a double edged sword for the maximum city. While the city does witness pleasant weather conditions when it rains for days, the hardships that come along with it cannot be ignored. Any given day when Mumbai receives heavy rains, traffic woes and water logging is a common problem. Hefty rains in the city make life miserable for the Mumbaikars. So much so that the city that never sleeps comes to an abrupt halt when Monsoon rains refuse to take a back seat. It’s then when the residents who crave for rainy days all year long beg the rain gods to put a pause to heavy showers. Mumbai Rains make everything troublesome when rain gods batter the maximum city. Whether it is the never ending traffic jams and waterlogged roads, delayed local trains or the huge pot holes that leave Mumbai scarred and helpless. While Mumbai rains would have been loved a little too more minus the hardships faced by the residents. 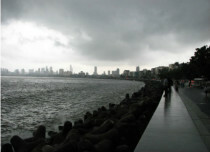 However, love it or hate it, Mumbai rains will always be craved by the residents of the maximum city.